As reported on Tuesday, Conor McGregor and Khabib Nurmagomedov have recently been trading jabs on social media, and during public appearances. Last we left off, Khabib had compared McGregor to "a jealous wife" while speaking to students of Moscow's Plekhanov Russian University of Economics. 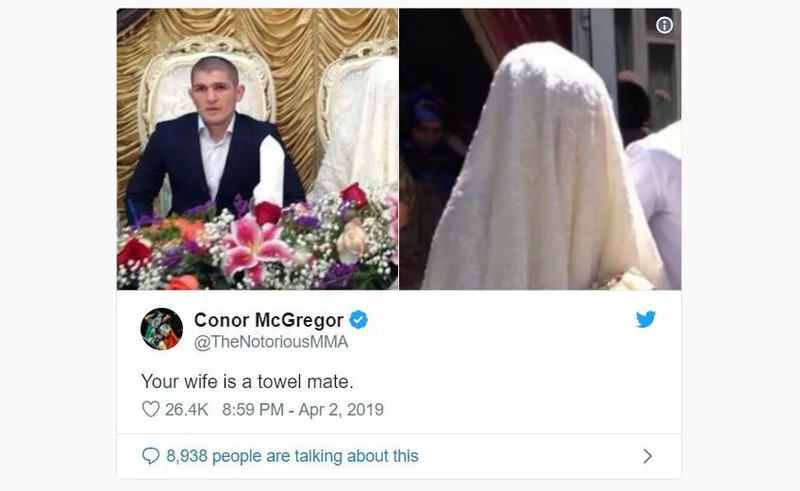 McGregor issued his response Tuesday night on twitter, which included a photo of Khabib and his wife on their wedding day. This since deleted post simply reads, "Your wife is a towel mate." The tweet was up for roughly 15 minutes before it was taken down, but McGregor wasn't finished coming at Khabib. He also tweeted, "Don’t be scared of the rematch you little scurrying rat. You will do what you are told like you always do." Though McGregor recently "retired" from the fight game, he would surely get back in the octagon for another crack at the undefeated Lightweight champion. The 30-year old Irishman tapped out to Khabib in the fourth round of UFC 229, and we all know the chaotic melee that ensued afterward.